I love anything that is simple to make, quick to get on the table and super delicious! Stir-fry dinners are so easy and can be adapted to your family’s taste by changing out for any proteins and vegetables. I don’t generally follow a recipe to make my stir-fry but will simply come up with something on the fly. Eggs, chicken, tofu, beef… vegetables du jour… and whatever sauce I think can tie the whole thing together. Here is a delicious recipe for one I made recently. Enjoy! Blend egg whites, 2 teaspoons soy sauce, 1 teaspoon cornstarch, garlic, salt and pepper in medium mixing bowl. Add beef and stir to coat. Cover and refrigerate 30 minutes. Combine cold water, remaining 3 teaspoons soy sauce, remaining cornstarch, and soup mix in small mixing bowl. Combine well and set aside. Heat 2 tablespoons oil in a wok. 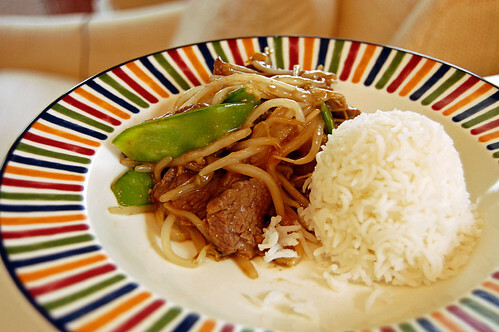 Add beef mixture and stir-fry over medium-high heat until beef is browned. Remove mixture from the wok and set aside. Add bean sprouts to the wok and stir-fry for one minute. Stir in the cornstarch mixture and the beef and cook until thickened. Serve with rice.